We all knew this was needed as not everyone has up to date hardware. •Towns were also overhauled to also give new life to them, you'll see a lot of new vendors with their own stalls, you'll also see a huge variety of new clutter, plants and flower, cloth lines and more, they will now feel like veritable functioning towns. *If your PC can handle them at 30+ FPS i sincerely recommend that you don't remove any of the mods affecting them as it will take a lot of the immersion out of the pack, but i understand that not everyone has the money to invest in PC's and i'll guide you through removing some of these mods,only remove them if you really have to and you get 15-25 FPS in towns. *Do the same thing for Dawnguard.esm, HearthFires.esm and Dragonborn.esm and remember only select 1 .esm at a time,TES5Edit will load anything else the file needs on it's own. I hope this covers all the performance tweaks for the pack and you find them useful the rest is up to your PC. This helped a lot! especially the video memory change. I did crash in riverwood tho. I was standing in the middle and waited for 10 hours. At night vampire dogs attacked the town and I was going to help and crash :(. Could you possibly do a write up on changing ENBs? I think that's one of the biggest personal preferences people have. I'd like to use natural lighting and atmospherics enb or project enb. How would I go about this? Strange,never had a crash in 22h of gameplay.Try disabling immersive creatures additional spawn and night spawns. I'm getting decent fps in skyrim general, ranging from 40-50 fps on my R9 290, but my fps seems to tank into the single digits the moment I go near a city. Any idea what could be causing this? It seems to dip really badly when I'm near a city in certain places, which is really strange. Really only happens if I'm by the city and looking directly at it. Otherwise, the pack runs beautifully. I know what might be the problems but can't test it right now. What you can do if you want to play around. •Save in an inside cell like dungeon! •Exit the game and backup your saves. •Load your save and go to the trouble spots and see if you still dip. I have begun my playthrough and enjoy it a lot thanks to you RottenDub! Possible fix for bad FPS in Whiterun. Go in Whiterun and pick all the flowers and plants ☺ and i got better performance.Lurking around the area for some time also helps. A lot of plants are near the tree, near the priest, near the statue and the lavenders at the waterway! Do you think with 4.2 we can tune down the npc and animals/plants mods? The mod is amazing and I'd hate to give it away... it makes Skyrim feel so lively.. but let's say reduce 50% of the mod effect maybe? Me and friend came across a very interesting performance boost for people with hyperthreading cpus as i own one myself a 2600k. I been trying to talk friend into playing skyrim ( a modded skyrim ) but he dont know nothing bout mods so i told him about ur pack. So he downloaded and i was watching him on screenshare to make sure he did everything right ect ect. So before i get to it, his pc config is a i5 2500k i believe without hyperthreading and gpu is a 780. I run a i72600k and a 980 classified gpu. So he gets everything set up and told him to pick the start that spawns him in whiterun so can test the frames...well to my shock, he had way way better frames than me and 0 stutter....ive always had stutter and just accepted it so was quite confused why his was so much better than mine, outside he was avg 60 easly. Im on skype with him just curseing up a storm like wtf lol. So i screen share my screen with him and he is like um ya something wrong on ur end. So i installed same gpu driver version, same nvidia settings, same OC on cpu, pretty much copied him and still wasnt no improvment. Where he would get 60 i would be in 20s and never even got close to 60, not even outside, mine was around 40ish to 50. So then i remembered his cpu has no hyper threading so i was like let me turn that off and test. Turned it off and ya..huge improvment, i maintained 60 whole time outside as i ran same path we had been so test was some what accurate. In whiterun my frames were above 40 and almost 60 in most spot, before highest i ever seen was 30ish and stutters was gone. Ya i wouldnt think it would work for everyone as a number of things could cause the stutter but for me was def a huge improvment, soon as i went out into white run i could tell without even having to look at my fps. I have been meshing around with settings. And i noticed that if in config i set it on high settings then when in game i get some textures glitched and etc. for example the sky,clouds,the smoke from fires.. But if i put it on very high settings it all plays good. Any advise what this might cause it? Never mind.i saw in forum it was vivid weather and fixed it! 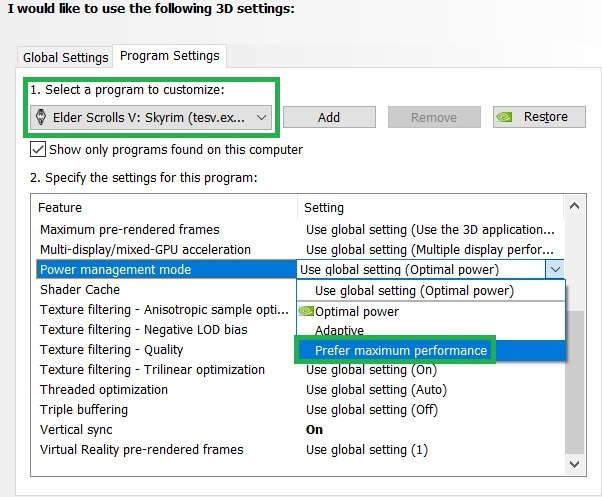 Disabling Dawn of Skyrim Collection will solve most problems relating to performance in towns. Pack should run buttery smooth in all other areas. I had planned to disable mods to improve frames but when i saw friend on 780 and get 20-30 higher frames than me in towns, i knew something had to be up lol, so for me personally, hyper threading off fixed issue, even thinking of enabling some of the optional mods now. And to Crazygeek, that issue u said u were having, i noticed other day the smoke effect from fires had a weird like color effect going on, looked kinda glitched, u said its related to vivid weathers, what did u do to fix, just disable or a tweak u made? Oh ok, ya before i turned off HT i changed graphic settings and was actually crashing non stop, couldnt even load game, had to turn back up before game would load but noticed some weird effects of smoke on fireplace in uh Riverwood, will double check though. You have installed skyrim hd textures DLC? Was saying that when i went through graphic settings through the configuratior in MO, i put them on medium when i was getting low frames to see if it helped but game would just instant crash on loading for some reason untill i put the graphics back on very high, saw artifiacts on the fire pit in the riverwood inn is all before. After playing so many hours with version 2.0.6 i have updated to 4.1. I have read all information about the pack, and I'm adding new mods to increase my enjoy in these awesome wolrd. My question is there is a little guide how to order mods without using loot. This is beacause the Rotten order will be modified. Only as of 4.2, changing iTexMipMapSkip to 0 changes the Texture Quality setting back up to Very High, like the settings are more closely tied than before. Editing SkyrimPrefs from within and outside of MO has the same effect. Do you know why this might have changed? I made a bashed patch this time, and had not back before this little problem, other than that the only changes are between 4.1 and 4.2. Fresh install of 4.1 and immediate update to 4.2. So you are saying that you can't change texture quality? I have not modified anything in the profile,only load order. Yes, if I change the texture quality from Very High to High, iTexMipMapSkip changes to 1, which is normal but if I change iTexMipMapSkip back to 0 then Texture Quality in the Skyrim Configurator changes back to Very High, so now I really can't lower the texture quality without particling up the cloud textures. Curious, I also ran FNIS ASIS and Dual Sheath Redux before experiencing this, which I had not done before. I should start over and check if this happens after patches but before the update. Nothing wrong with this. The texture quality is bound to the "iTexMipMapSkip" it seems. But changing it back to "0" doesn't mean the other settings bound to the "high" texture quality are changed to "very high" again. I may be wrong here. Another matter : I had unbearable stuttering and now the game runs like a charm. 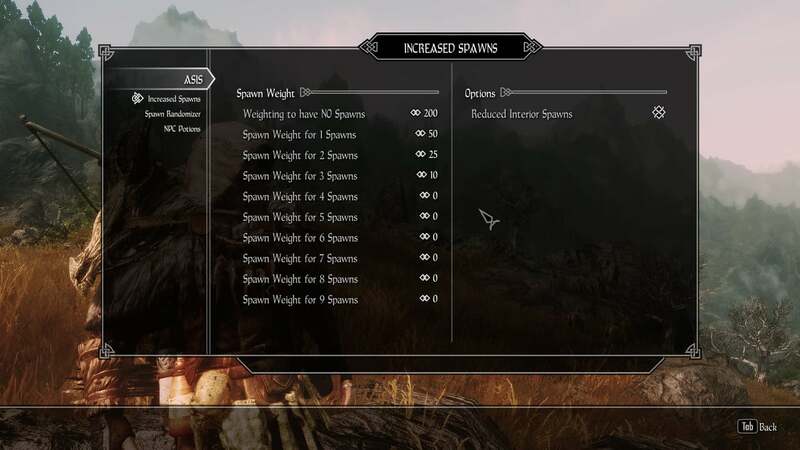 The trick was using Ordenador (it is already ready to perform in the Skyrim folder, it is just a mystery to me as to why Rotten did not talk about it in this thread) using the "maximum" preset and resizing if >1024. For me the change is just enormous ! It's because I play with a slow HDD and 2gb of VRAM (laptop but I play all modern games without a problem). 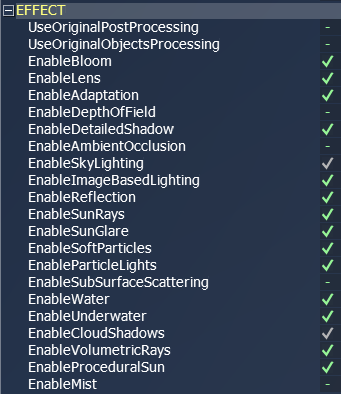 With this trick I can enable all the optional HD textures without a hitch. I just tried briefly but did not notice any lower quality. I am finally ready to enjoy this piece of paradise ! Why i haven't talked about it because if you don't do it right it will screw up the textures and it's a little more advanced, but left the program there for a reason, so people will use it if need be as a "last resort" solution. Do it wrong, what do you mean ? I kept a backup so no worries but I would like to know what must be avoided. Textures can get "garbled" or "stretched" sometimes. I don't know exactly what mush be avoided because I'm not familiar with the format and compression method it uses. I have gtx980m and fps is low in towns or woods due to a dense grass. I changed the grass size to 125, it helped to raise fps but still a bit buggy in towns. Rotten, what is the highest grass size should be for performance, can I go beyond 125 ? I am having some issues with the particles with smoke/fog/etc. At first it looked fine but the game stuttered far too much. I tried to set texture quality down to high and the stuttering mostly goes away, but then smoke/etc goes all glitchy and looks very blocky. If I have iTexMipMapSkip to 0, as recommended in a few places, it forces the texture quality back up to max. I had already lowered other settings based on the recommendations but the only thing that allows smooth gameplay is setting tetxures to 'high' or lower. Any recommendations on fixing the smoke/etc without maxing out texture quality? No, but tips anyways. I'm pretty sure iTexMipMapSkip has to be 0, and I'm afraid that Texture Quality has to be Very High now. Very High was too high for me too at first, until I changed the sD3DDevice in SkyrimPrefs.ini to what my video card actually is and changed VideoMemorySizeMb to the number this tool gave me, minus 2000. Disabling Dawn of Skyrim and Beautiful Whiterun probably also helped but I think they're both off by default in PM4.2 anyways. Thanks for that, I didn't think changing the videomemorysizemb setting would make such a big difference. I just had it set to 1024 originally. It is definitely playable now, though I went by a slightly different calculation provided elsewhere (value given -170). I don't think that 'sD3DDevice' matters outside of the launcher though. Though, still, when it rains/storms the FPS takes a fairly big hit, I might try the texture compressor mentioned elsewhere, ordenador, and see how that goes. You can disable Vivid Weathers and see if you get any boost,disabling it you won't have to set iTexMipMapSkip to 0 and you can play with texture quality.OFC you will lose some weather types. I tried to disable this mod and had ctd during the game launch. Is there a way to detick it? I Feel like I'm getting worse performance out of the pack than I should, considering my specs are very close to the recommended. With a GTX 970, i5-4670, and 16 Gigabites of RAM, I'm averaging between 26 and 60fps in the wilderness, usually in the 30s and 40s, and 9-30fps in whiterun, usually in the 10s and 20s. I've made sure my drivers are up to date, and are using very performance friendly options in the nvidia control panel. I'm running it on a defragmented HDD, and have everything else the same as a vanilla install. I know this is still kind of vague, and you aren't an expert on benchmarking, but if you have any questions or advice, let me know. I love this pack, and I'd like to be able to play it with steady frames. 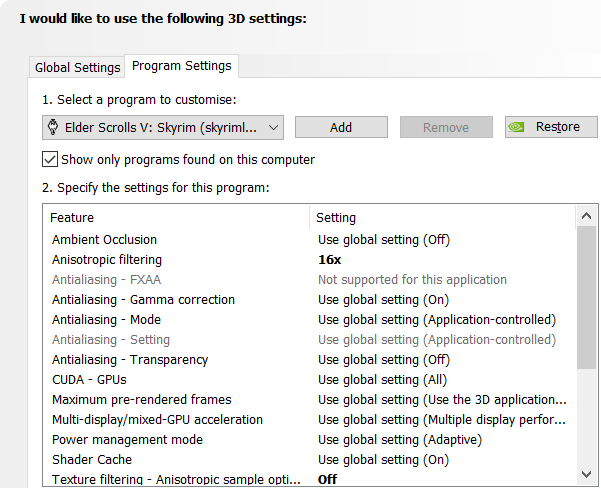 Disabling dawn of skyrim will solve most of the FPS issues in-towns. I also had the pack on a HDD (7200 RPS) and it was running fine,will depend on your HDD. So basically after turning my textures to high from very high, I'm getting this weird patchy green/red squares floating around the massive mountain high hrogthgar? And above the furnace, I think the smoke textures died. I did this and I still have blocky particles, it doesn't work on High no matter what I do but works on Very High. Setting iTexMipMapSkip to 0 will force the texture quality to very high. If iTexMipMapSkip is NOT set to 0, smoke/fog/etc will glitch out and will appear blocky and discolored. The ONLY way around this is to remove the Vivid Weathers mod that makes modifications to smoke, fog, etc. Thanks for this pack and all the effort/time you put into it. I see myself rather playing this than my own skyrim already. aren't anywhere in my enblocal.ini. Which category would I add them under? That's not possible every enblocal.ini (even if you downloaded another ENB) has to have those lines, are you sure you didn't open enbseries.ini instead of local?